Back in August when I moved to Houston, I was searching the web for inspiration on decorating my “office” and happened upon the Matthew Studios website. 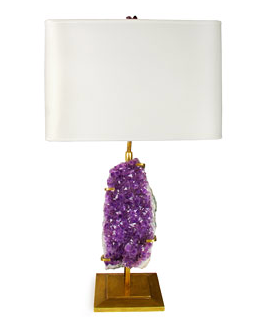 Specializing in luxury lighting, Matthew Studios uses incredible materials such as Pyrite, Amethyst, Smokey Quartz, Turquoise, and more to create stunning table lamps, stylish wall sconces and custom lighting pieces for your home or office. 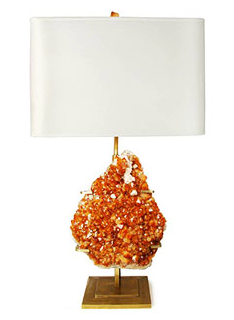 They have a very 70’s appeal (which is very in for fall 2011), with bright pops of color and warm brass finishes. 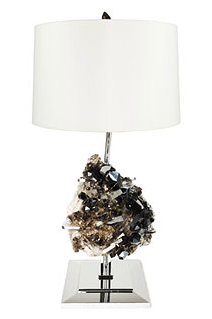 What’s great about these lamps is that you don’t have to buy the entire collection to get the desired effect – all you need is one or two in your house for the perfect eye-catching accessory. Below are my favorite pieces from the website – click on the images to be taken to the full product description and additional photos. Matthew Studios pieces are available online at Vivre and Rare Culture and custom orders are also available. For more information on custom orders, click here!